The incredible popularity of the modern navel piercing (also known as belly button piercings) can be traced to a single event: the video for Aerosmith’s “Cryin’,” released in 1993. In it, Alicia Silverstone—actually, her body double—had her navel pierced by Gauntlet piercer Paul King. Soon after, Madonna was photographed extensively with her new navel jewelry, and model Christy Turlington was seen showing off hers at a fashion show in London. Popular or not, not all navels are suitable for piercing. (While almost all navels can be pierced, the trick is healing the piercing—and not all navels are shaped to accommodate this.) In order to be a candidate for a navel piercing, you need to have a protruding lip of skin on the top (or, uncommonly, on the bottom) of your navel, with enough space behind the flap for jewelry to sit comfortably. The flap must have a definite front and back, with a clear edge dividing the two. If your navel has more of a rounded slope that curves under, if there is not sufficient space behind the flap for jewelry to properly sit, or if your navel collapses when you sit down, you may not be a good candidate for this one. (Describing the ideal navel for piercing can be difficult, but if you look at our gallery pictures you can start to see what we’re talking about.) If you’re interested in this piercing, come in and talk to one of our piercers. We can take a look at the way your navel is shaped and let you know whether we think this one will work for you. One reason we’re so selective with anatomy is that navel piercings tend to be difficult to heal. We tell clients to prepare for six months to one full year of healing, and that’s no exaggeration. Navel tissue is not very vascular, as it’s simply scar tissue going back to when you were born. It is also considered a high-traffic area. As such, they’re prone to irritation from everything from the jewelry getting twisted when sitting or exercising to rubbing from tight-fitting clothing and waistbands. (This piercing is not very forgiving.) That being said, if you want a healed and attractive navel piercing for swimsuit weather, you’ll probably want to consider getting this piercing the winter before. 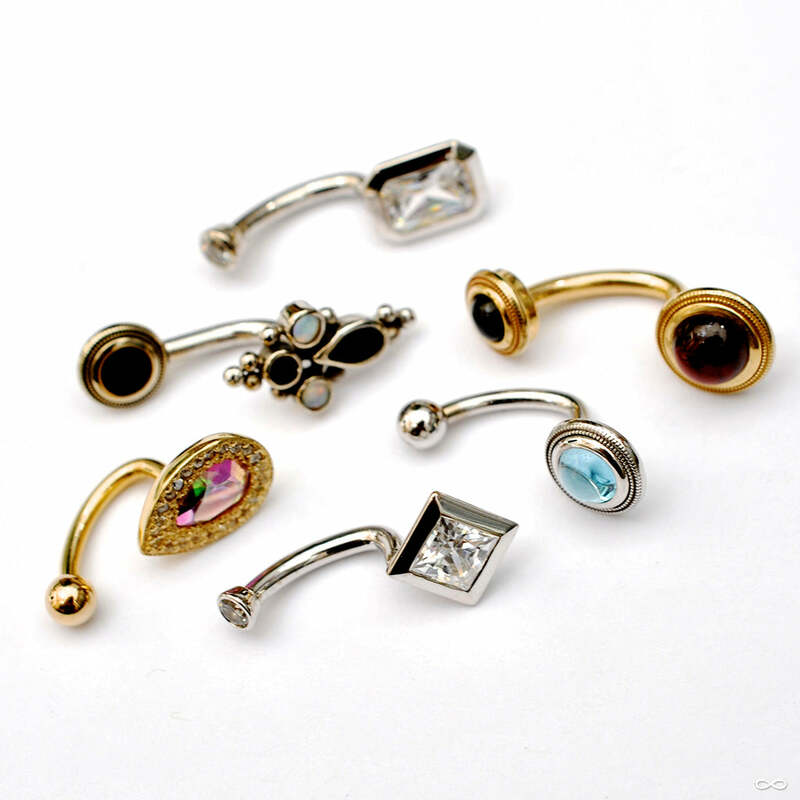 The jewelry we suggest for an initial navel piercing is most often a 12 gauge curved barbell. (Rings are not usually suitable for initial healing.) Healing can be difficult with anything too big, ornate, or dangly, but after healing the only limit is your imagination (or your budget). Check out our gallery to get some ideas.